Be the first to share your favorite memory, photo or story of Junior. This memorial page is dedicated for family, friends and future generations to celebrate the life of their loved one. 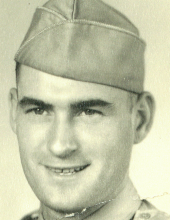 Junior Lee Bentley, 88 of Westfield Twp., Ohio passed away Saturday, March 23, 2019 at his home, following a lengthy period of declining health. He was born June 3, 1930 in Clearfield, KY to Quiller and Lacey (Wallace) Bentley. He grew up in Morehead, KY, and at age 17 he moved to Cleveland where he began working at Alcoa. He retired in 1992 following 45 years of service. During that period, he served with the U.S. Army in Korea. He was a member of the Local District 54 Lodge 1297 of The International Association of Machinists and Aerospace Workers. He held a Master Welders Certificate, and helped put the first space shuttle into outer space by assisting with the fabrication of its heat shields. He also built numerous aircraft parts for military fighter jets. He was a highly skilled welder, and a very creative and innovative individual, developing different styles of welding and fabricating, as well as teaching many people the trade of welding. Junior enjoyed farming and gardening, and liked raising garlic and fruit trees. 6 Siblings, Sanford, Elijah, and Ray (Sue) Bentley. He was preceded in death by his parents, infant son William David, sister Joyce Faye Bentley, brother Ernest Bentley, and son-in-law Thomas P. Rice. Private Funeral service will be held with interment at Ohio Western Reserve National Cemetery. "Email Address" would like to share the life celebration of Junior L. Bentley. Click on the "link" to go to share a favorite memory or leave a condolence message for the family.